What would you say if I told you there was a way to grab authority and topic relevance for your webpages by STEALING it from high authority websites that google already loves– AND you could do it without getting a backlink from those sites? You heard me, you can leverage ANY site and get Google to think you are best friends, thus giving you more ranking power, WITHOUT any backlinks from that site at all. It’s called Co-Citation, and this best kept secret SEO ranking trick has actually been around since 2012 when Google started moving away from backlinks as it’s favorite ranking factor towards a more semantic approach. In 2012 and 2013, SEO's started observing a new phenomenon that was affecting rankings. They dubbed this new ranking factor "Co-Citation" or "Co-Occurance". Here's what Search Engine Journal had to say about the evolution of Google's algorithms towards using mentions of websites in conjunction with other websites as ranking factors. The normal way of boosting your page rankings has always been by getting direct backlinks, coupled with keyword rich anchortexts. Now you can have some link wheel action, or web 2.0 sites in between, to buffer you against penalties. But generally, everyone assumes that link juice always flows ONE direction-- from the linking site to the site receiving the link. This is called Direct Citation as shown in the simplified drawing below. But Co-Citation defies the normal link juice flow, and allows influence and topical relevance to be bestowed merely by being mentioned on the same page as other authorities in a subject. In other words, if another site that regularly talks about a certain topic regularly mentions your site in connection with content from other trusted sites, Google sees that as an IMPLIED LINK between your site and the authority site. This is called Co-Citation or Co-Occurance as shown in the simplified drawing below. And if you really think about it, this means the influence of the authority sites is actually flowing BACKWARDS to the site doing the news/curation, (remember that Google loves news and curation) and then forward again to your own site. Search Engine Journal also noted that the potential effect of having many co-citations from impartial [appearing] sources can create a significant positive effect on the rankings of your website or blog. While you can easily implement co-citation as an SEO strategy using PBNs or Web 2.0 sites, doing it that way will require writing many articles and creating a lot of content to have much impact. Another easier, faster method is to use syndication or RSS feeds to create "living" co-citation streams where one or more pieces of your own content consistently appear next to content from other authority sites. 1. Content Freshness - Google loves fresh content, and over time, articles will lose their "punch" as Google indexes and spotlights newer content. But RSS Feeds will constantly change over time, which keeps search engines coming back to re-index frequently. 2. Speed of Co-Citation Creation - It's much faster to simply find some related high ranking websites with RSS feeds to include in a co-citation feed than to write and post new articles. 3. Reduced Content Creation Costs - By using RSS Feeds to create the co-citations between your site and other authority sites you will not only save time, but quite a bit of money on article writers and spinner services. Which means you can concentrate on simply putting out great content. 4. 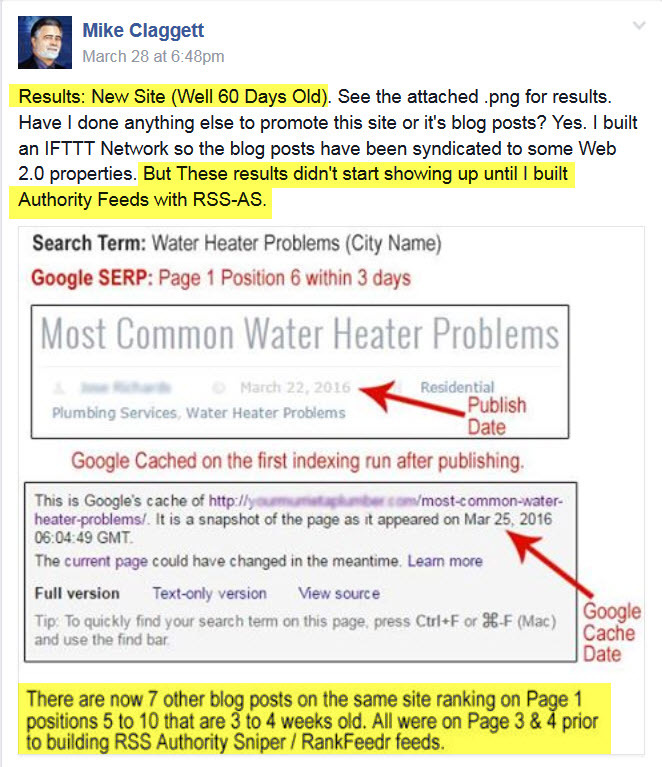 Feeds Are Not Penalized - RSS Feeds avoid much of the potential penalties Google doles out for duplicate content, or unnatural backlinks. Feeds are meant to be a way of announcing and spreading content, so they are not treated the same way. 5. Reduced Footprint - By Using a Co-Citation feed hosting service, your feeds are mixed in with other feeds on the service, which means you have no detectable footprint to indicate you are the creator of all of the feeds which are gather co-citation juice for your website. 1. Your Targeted Content Page URL/Entry - This is the piece of content you want to receive the co-citation juice from the carefully selected authority sites in the feed. This item is ALWAYS in the feed for long term effectiveness. 2. Your Website RSS Feed - The regular RSS Feed of your website. This makes it so the Target content doesn't stick out like a sore thumb among the other feeds. 3. Niche Authority Website #1 RSS Feed - The RSS Feed of an authority in the target niche that is ranked highly for the keywords you are going after. Keeps feed fresh and provides co-citations. 4. Niche Authority Website #2 RSS Feed - The RSS Feed of a second authority in the target niche that is ranked highly for the keywords you are going after. 5. 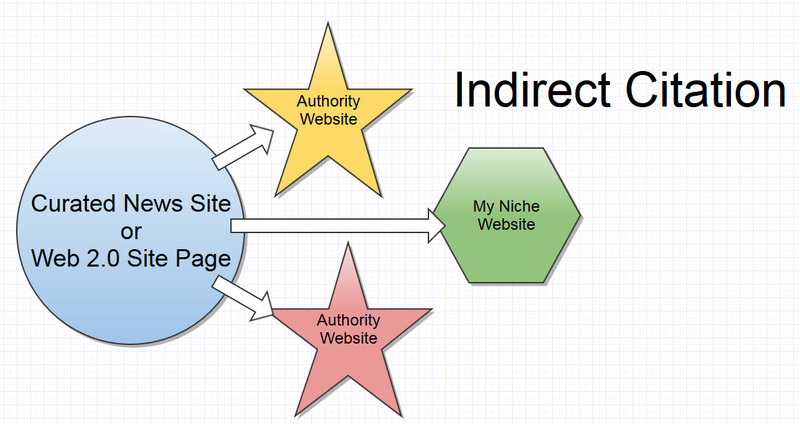 Niche Authority Website #3 RSS Feed - The RSS Feed of a third authority in the target niche that is ranked highly for the keywords you are going after. Another alternative used by some SEOs is the addition of two more authority page links that always stay in the co-citation feed. 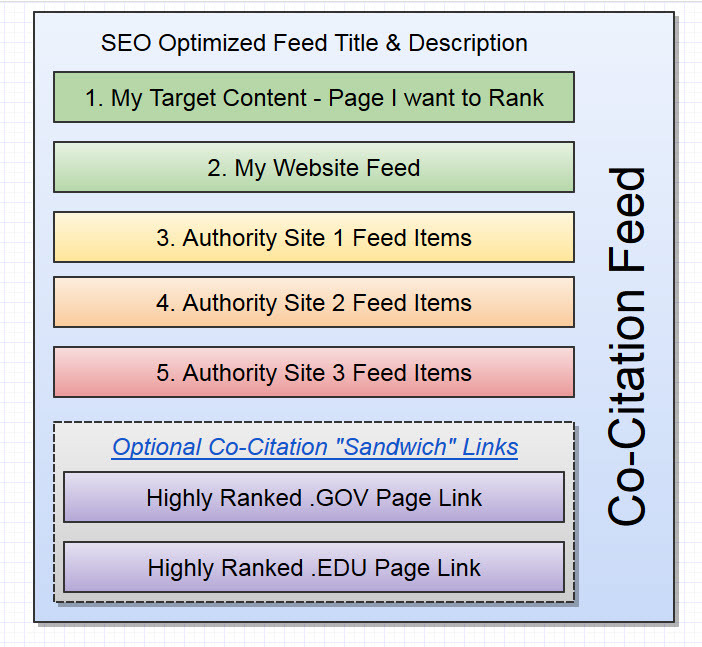 By adding one highly ranked, topic targeted link from a .GOV site, and one more from an .EDU site, the feed gains another level of authority and topic relevance, which it can then channel to your content. In 2013 we built and launched a desktop software product called RSS Authority Sniper which used Yahoo Pipes to publish the type of Co-Citation feeds you see outlined above. It was a wildly popular product, and our customers loved the fast indexing and ranking benefits their websites and video channels received over time from this strategy. However, in September 2015, Yahoo unexpectedly decided to close Pipes. Though we reviewed over fifty other feed combining services, there were no Free or Paid services we could find that could implement the Co-Citation strategy fully. Because of the need for a very specific structure and the ability to keep an article or page in the feed indefinitely and to be able to add items that were NOT contained in any available RSS feed, we decided to create a feed service specifically for Co-Citation Feeds and Accelerated Page Indexing. 1. Static Items - RankFeedr can add items to the feeds it creates that are not part of any existing RSS Feed. This means even sites without RSS Feeds can use RankFeedr to create powerful co-citations using syndication. And the target article or video stays in the feed forever, so the effectiveness of the co-citation keeps on going. 2. SEO Friendly URLS - Most RSS Feed combining or mashing services only give you randomly generated URLS for your feeds with no SEO value whatsoever. RankFeedt generates your feed URL from your feed titles, for keyword optimization. 3. SEO Optimizable Feed Descriptions - Most RSS Feed combining or mashing services brand your feed in the description with their own name, diluting the SEO value of the feed. But RankFeedr allows you to seo optimize your feed descriptions with LSI keywords. 4. Fully Re-Editable Feeds - With other feed combining services, once your feeds are created, they are set in stone. You can never edit them, add new content, or re-optimize the feed for better results. But RankFeedr allows you to change your feeds at any time, while still keeping the original feed URL intact. 5. Accelerated Ping Indexing - RankFeedr will also notifiy 97 different ping services about your new feeds, and keep search engines coming back with drip ping capabilities. This is HUGE, since you can't benefit from co-citations search engines don't know about. The effects of co-citations are in most cases fairly quick, and can include grabbing page one rankings, fast indexing and quickly improved domain authority. Just check out the reported results below of one of our current customers after using RankFeedr to create authority co-citation feeds for his content. As you can see above, Mike was able to push EIGHT different pieces of his content onto page one for his keywords in a very short amount of time after creating Authority Co-Citation Feeds for those pages using RankFeedr. Google Indexing also occurred within just a couple of days AND his domain's measurable authority increased rapidly from DA 6 to DA 11. This site is only 60 days old so that is a lot of domain authority for a new site. Copyright 2019 - MindLink Labs.